At least since Sonny Rollins released Way out West in 1957, we've heard jazz with a cowboy tinge. For some players it comes naturally, as in the sound of Texas guitar masters Charlie Christian or Herb Ellis. Cohen, for his part, born in California, here brings out that part of his sensibilities, notwithstanding the fact that his career has mainly been unfurling on the East Coast. 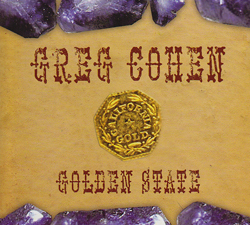 Although it is Cohen's date and a personal tribute to his home state of California, and all songs are by Cohen (except for three standard tunes), this is very much a bona fide duo between leader/bassist Greg Cohn and guitar hired hand Bill Frisell. Cohen's inventive lines entwine beautifully with Frisell's theme statements and the latter's voicings color the set of nine tunes perfectly � his twangy yet not overly processed sound makes this tribute to the western dream state glow. The lopping "Old Gravenstein," in reference to a road in Sonoma County, opens the set and establish the joyful, carefree and sunny tone of the album. While the very spare guitar-bass sound can be thin at times, these players, with a wealth of imagination and stylistically sophisticated chops, and each with a wealth of experience in varied musical setting, work fine threads of melody and accompaniment through the 45 minutes or so of music. Frisell, of course, has been here before (his Ghost Town being the most obvious example of his foray into the repertoire and style defined as country or country-western). Cohen's discography has nothing as obviously western to it. But it's not all cows and prairies. There are many moments of quirky swing ("Santa Susana") or out-side the lines playing ("Benitoite Blue," "Beheading Your Way") making this western jazz album not your expected twang and strum offering. The three covers are Illinois Jacquet and Charles Thompson's "Robbins Nest," done in a very loose and easy manner; the old corny chestnut "South of the Boarder" done in an endearing rumba style; and the lesser known but perfectly jazzy "California Here I Come."